Joe and Ryan race inside, Dorothy is furious but says she has insurance. 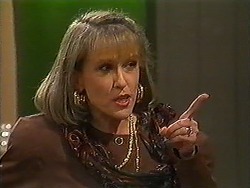 Ryan then takes the blame; Dorothy quickly changes her tune and decides that accidents can happen! Harold is packing to go home, Madge returns to tell him and Jim about the tree in number 30, Jim finds it funny but Harold says someone could have been hurt. Madge has bought Harold a lot of new clothes because Jim has a new image and Madge thinks Harold should have one too. Beverly tells Kerry about Jim's visit, she thinks he cheated in New York and his return to engineering means he is building a new life without her. Kerry insists she must tell Jim about the baby. Joe and Ryan are clearing up; Ryan says he took the blame because Dorothy wouldn't be as angry then. 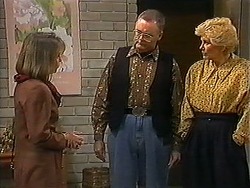 Joe offers to put some plastic sheeting over the window and then finds Dorothy's wedding photo which has been smashed. Dorothy says Colin (her husband) has been gone over 12 years. Toby wants Joe to sponsor him in a 40 hour famine, he wants Joe to take part and it starts now! Joe reluctantly agrees but apparently he is allowed a very small piece of Barley Sugar, as Kerry and Toby tuck in to dinner (Toby isn't allowed to fast the entire time), Joe sits there looking miserable. Felicity has arrived at the door, Madge has been telling everyone that Felicity was to blame for the fire, they argue and Felicity says she will sue if they start making accusations! Harold is outside, Joe spots him and starts laughing at his clothes, and Harold is upset because no one laughed at Jim with his new clothes. Harold is very impressed with Joe's 40 hour famine although he is desperate for food. Back inside Harold gets changed out of his trendy clothes! 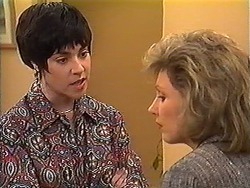 Madge is telling Kerry about Felicity, Kerry tells Madge to remain calm and ignore her. Madge says that's easier said than done. Kerry than says she likes Harold's new clothes. 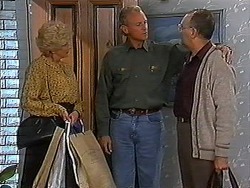 Beverly is checking Harold has recovered from the fire as Jim arrives to ask if Todd is OK. Beverly is very defensive and leaves because she thinks Jim is criticising her upbringing of Todd. 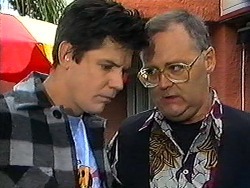 Harold asks Jim if he and Beverly can get back together, Jim isn't sure and thinks it might be over. 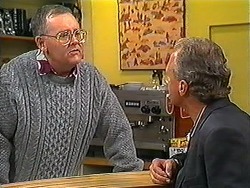 Harold says that Jim's new work ideas and his new image might imply that he is moving on as a single man. 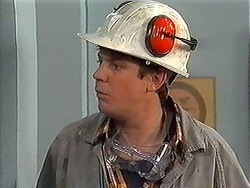 Jim replies by saying that he realised that he can cope on his own but is willing to see if his marriage can be saved. 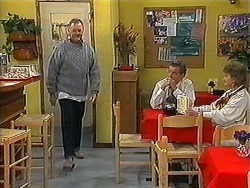 Madge arrives and Harold hides in the kitchen to change back into his new clothes, Madge takes some money for shopping. 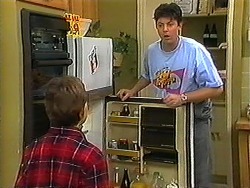 Joe arrives home and opens the fridge, he reaches inside, Toby catches him and is a bit angry. Joe begs him for some food but Toby won't let him, he decides to hang around to make sure Joe doesn't cheat. Madge returns from shopping and Harold is in his old clothes, he says he was cold and Madge believes him. 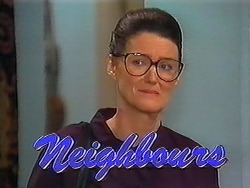 Dorothy is annoyed that the glazier hasn't turned up yet but Madge mentions that there was a man in her garden earlier; Dorothy rushes off with Ryan as she thinks there was a burglar. Jim has taken Todd out and Beverly feels left out, Joe comes in and is starving, Toby feed Bouncer some sausages as Joe looks on enviously! Dorothy and Ryan return home to find some bags in the hallway, Rosie (a dog) comes running to Ryan. DOROTHY: I know exactly what it means. Why him? Anyone but him.